Vladimir Putin’s United Russia party won 64% of the vote in recent Russian elections, assuring that his loyalists control the rubber-stamp Russian parliament. 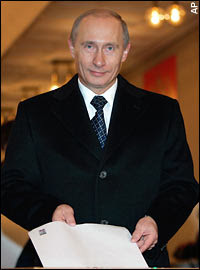 International election observers (most of whom were barred by Putin from the country), including the Organization for Security and Cooperation in Europe and the Council of Europe, condemned the conduct of the election, calling it unfair and undemocratic (Telegraph.co.uk 12/3/07). The Economist called it a “sham election” (Economist 12/1/07). Actually, Mr. Putin himself was not up for reelection, but only lent his name to the United Russia party packed with his people. Putin is actually not even a member of that party, but by associating himself with it and ensuring its victory, he can interpret the result as a referendum on his leadership and as a mandate to continue running the country even after his term as president expires next year. How was it done? Small parties were banned from fielding candidates and also banned from forming coalitions. The minimum turnout rule was abolished so the vote would be valid even if hardly anybody voted. Opposition leaders were harassed, arrested, and had their bank accounts frozen. State-run television covered only Putin’s party. Opposition party rallies were violently broken up by police. Opposition leader and former chess champion Gary Kasparov, was jailed for five days and denied a lawyer, one week before the election. Charges of polling place obstruction and ballot box stuffing were widespread. But the puzzling question is, why bother? What is the point of having a mock election? Why doesn’t Putin just consolidate his power and either continue to run the country from the sidelines, as Chairman Deng did in China in the ‘80s, or invalidate the constitution and continue as president. Nothing could stop him from either path. Or, most simply, he could have a free and fair election and win it using the state controlled media and its power of censorship. Why didn't he do any of those things? Ostensibly, Putin wants to have the “legitimacy” of a popular mandate. But that raises two questions. 1. Why should he care about legitimacy? Lots of other dictators don’t have democratic legitimacy and they get along just fine. What does the mantle of legitimacy do for him? 2. Who is fooled into thinking he has achieved political legitimacy with a fraudulent election? The election observers were not fooled. Foreign governments are not fooled. The opposition parties are not fooled. Possibly the majority of Russian people will be fooled. But even if they are, the question cycles back to the first one: why does that matter? 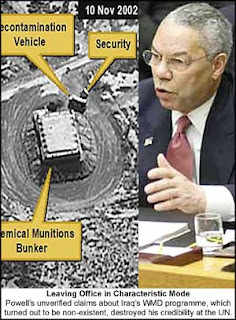 When the US invaded Iraq, the pretext of WMD’s was to deceive the American people and many foreign leaders too, presumably giving political legitimacy to the move. What would have happened if the US had dispensed with all that theater and just announced, “We’re invading Iraq now. Join in or stand aside.” Why did the government need “political legitimacy” to act? In the US, to take such an action without the cover of political legitimacy would be at least immoral, definitely illegal, and would certainly result in the impeachment of the president. Since the pretext was effective, congress and the news media were duped, a veneer of legitimacy was achieved, and the president kept his job. But that would not be the case in Putin’s Russia, which is only a pretend democracy and has no real need for political legitimacy. Putin faces no political risk from acting by fiat. So why did he spend so much effort constructing a see-through fig leaf? The answer has got to be that most people are stupid. If that is right, then in the future, Putin will be able to act offended if his supposed “legitimacy” is questioned, and some crowd of stupid people will believe him, allowing him to negotiate with more strength than he otherwise would have standing alone. Is that the game?